My family returned from our very first cruise a few weeks ago. For our inaugural cruise, we chose the Norwegian Escape. We were drawn to the the Eastern Caribbean ports, the ship’s amenities and loved that this was a relatively new ship. On this cruise, we traveled with our two children (aged 6 and 9) and two other couples. We were a group of 10 in total. We had a great experience aboard the Norwegian Escape. I was especially impressed with all the activities and amenities that the kids could enjoy. > The waterslides! The Escape has 5 water slides. Three of the slides are perfect for young kids. My kids loved the tube slide the most, they rode it a dozen times per day. > The aqua park. The kids aqua park has tons of fun things for kids to do. There’s a climbing section, spray blasters, buckets of water to dump onto others and a slide in the aqua park. > The pools. the main kids pool is open all day and well into the night. The adult pool is open to kids after 7pm. > The hot tubs. There are several hot tubs available throughout the pool decks. Several hot tubs are perched over the ocean. My kids loved sitting and relaxing in many of these hot tubs. > Movie night at Spice H2O. One of our favourite evenings was when we watched Disney’s Up! on the top deck at Spice H20. Popcorn was served, the temperature was warm and you could jump into the hot tub if you wished. > The Pullman bed in the family suites. This was perhaps one of the most exciting things for my kids. They were so happy to have a Pullman bed in our family balcony room. I really appreciated how this bed configuration gave us lots of room in our suite. > Splash Academy. My kids have never been big on kids clubs but they did enjoy the few times they went to Splash Academy during Free Play. The staff at Splash Academy was very friendly and outgoing. The facilities were modern and had many great activities and programs set up for all age ranges. > The ropes course. The Escape has a ropes course for little ones and a large ropes course for older kids and adults. My 6 year old and his friend adored the ropes course. They went on it almost every day and stayed on the ropes course for hours. Tip: if you only plan on using the toddler/small kids course go talk to the attendants and they won’t make you wait in line. > The mini golf. My kids played a dozen rounds of mini golf on the Escape. There was rarely a wait and the course way super fun. > The towel animals. The highlight of every night was returning to the room to see what towel animals were waiting for us. My kids LOVED these. They named them, cuddled them and wanted to take them home. >The ice cream. There was always soft serve available in the Garden Cafe. There was also hard ice cream and sorbet available at lunch time. > The shows. My kids loved the Broadway shows and the magic show on the ship. I really enjoyed experiencing live theatre and entertainment with them. > The Glow Party. My kids were super excited to attend the Glow Party at Spice H2O. The morning of the Glow Party we painted glow in the dark t-shirts. We all wore them at the party on the top deck. The party was hosted by some of the staff from Splash Academy. They had great games for the kids and played great music. Tip: bring glow sticks from home! > The Ports. My kids really enjoyed getting off the ship when at port and exploring our Caribbean stops. Getting on and off the ship was very easy. They absolutely loved the eucalyptus towels and drinks when we returned to the ship after our day at the beach. Our trip on the Norwegian Escape was very memorable. We loved the beautiful ship. The food, drinks, and entertainment. I strongly feel that cruises are great for families. My kids enjoyed every minute of the cruise and keep asking to go on another one. The Norwegian Escape was very kid friendly. It had specific activities geared at kids, the staff was extremely approachable and always interacted with our children. Our first cruise experience was very special and I cannot wait to go on another cruise. I’d love to know, have you been on a cruise with kids? 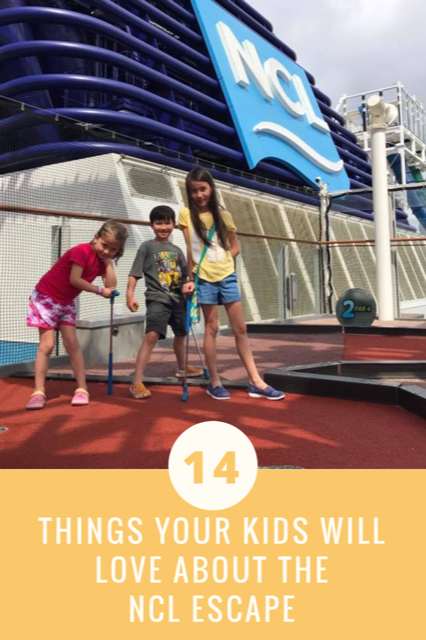 What did your kids like the most about cruising? Disclosure: I received special perks from Norwegian Cruise Lines to facilitate this review. All thoughts are my own and I truly loved our cruise experience. Those water slides look epic. My daughter loves water parks so I’m sure she would have a blast on this cruise. Looks like so much fun, I like cruising, but haven’t been on one since I was a young boy. It’s amazing to me just how many activities there are to do on a cruise ship. It looks like so much fun for the kids too, we’ve never been but would definitely consider it now. Great looking pictures of a place I know many children will enjoy visiting for sure. Wow not only is the ship absolutely huge, it’s also absolutely awesome ! I can’t believe how many activities there are for kids to do. Ah! That’s so great Karen. We absolutely love all the staff on board. Everyone was so kind and happy! Wow! What a great article. Thank you for sharing it. I’m sure my niece would love this trip. Those pics look great! Really captures what is going on. So glad your kids loved it! I have been cruising since I was 11 and used to love cruising as a child! It’s so so fun and exciting. Our girls LOVED the towel animals and 24-hour ice cream when we did our cruise too! This ship sounds like it has more for kids than our cruise did (we went with Carnival). All the water activities sound like fun. We’ll have to look into Norwegian for our next cruise. 🙂 Thanks for sharing! Never been on a cruise, but this looks like a lot of fun! When thinking of a cruise ship, I would never consider the kids but with so much stuff for them to do, all I can say is wow!! I would have never thought that they would have so much to keep the kids entertained!! Looks like a great cruise to go on with the kids. I did my first (and only) cruise 7 years ago. I would love to do another one soon. oh wow! That does look amazing. My hubby and I are huge fans of cruising. In fact, we did a 2 week Mediterranean cruise for our honeymoon. However, we haven’t gone since we had kids. This looks amazing – adding it to our 5 year vacation plan. It looks awesome! I’ve never been on a cruise but I’d love to someday, and this really looks like a great family adventure! Wow, they did have an awful lot on offer to keep the kids busy and free of boredom. Oh my goodness, I didn’t realize they so many thins for kids to do. Look like they have tons of fun. That looks like some really amazing fun! The Norwegian Escape would be a dream come true for any kid.How awesome! Love cruising with or without kids. We love the variety of activities, the amazing ports and the phenomenal food!